Concert hall, built 1872 for Ludwig Bösendorfer by converting the former "Liechtenstein Riding School". Used for solo recitals and chamber concerts. Praised by many world-famous composers and pianists for outstanding acoustics. Demolished 1913. 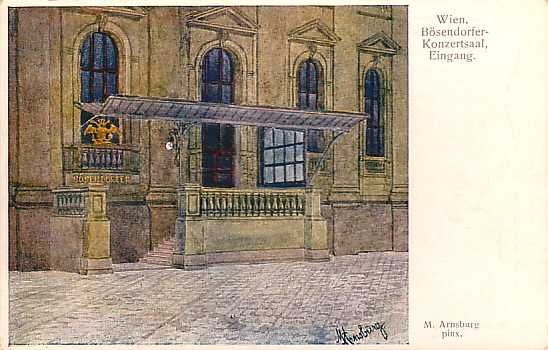 Front Text: "Wien, Bösendorfer-Konzertsaal, Eingang, M. Arnssburg pinx. ", sign: "Bösendorfer"